We took a walk over the lunch-hour today and stopped in a local toy store. It's a nice store, the Red Giraffe of Woodbury, MN, as they have a lot of wooden toys. But, like most toy stores or sections of a department store, they stock some junk as well. 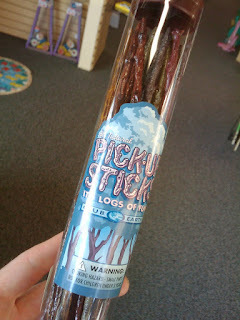 I was too shocked to pass this one up... a plastic tube of plastic sticks made to look like wood. The worst thing about it is that it's labeled "All Natural" which of course only lends credence to the fact that the word Natural means absolutely nothing at all in any kind of manufacturing or production sense. I've seen worse toys, but this is just ... an insult to children and parents. To the children for their legacy. Someone in this world thinks so little of them that they would make plastic replicas of STICKS to be played with, bent and thrown away, or just lost. For the parents, this is yet-another cheaply-produced toy comprised of, again, easily-lost pieces that the parents would spend forever cleaning up.